Dental Bridges vs. Dental Implants: What's the Difference? - Trusted Dentistry. Dental implants and dental bridges are both used to fill in gaps in your mouth where teeth are missing. Aside from that, these two dental tools are actually pretty different. Here is a basic breakdown of what each one is and the advantages associated with them. A dental bridge is basically three crowns put together. So if you only have one missing tooth, this option may not be for you. Your dentist will remove enamel from the teeth on either side of a gap to make space for the dental bridge. The bridge then rests on your gums and is held in place by the teeth surrounding it. The most prominent feature to note here is that dental bridges sit on top of the gum, which means they really only replace the crowns of your missing teeth. Installing a dental bridge is quick, easy, and safe. It will usually only take two visits to install your bridge, compared to a minimum of three visits for an implant. Dental bridges also typically cost less than dental implants. Dental implants differ in a few distinct ways. First, your other teeth are not used to hold the implant in place. Instead, a post is implanted into your jaw and the implant is fitted onto the post. That means an implant actually replaces your tooth root too. 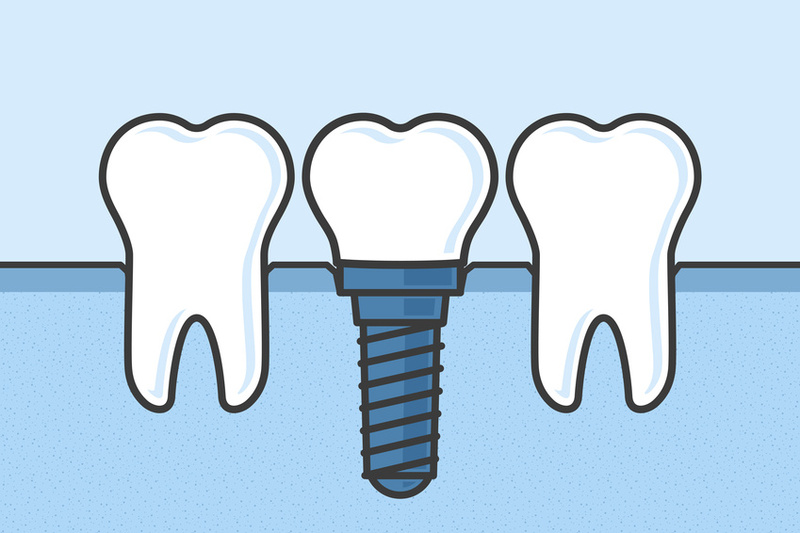 Second, individual teeth can be replaced with implants, whereas bridges are designed to replace multiple teeth. The biggest benefit of choosing an implant is that it supports your jaw health. The jaw bone remains healthy and strong which helps both your oral health and the shape of your face as you age. Dental implants also tend to look better and feel more natural in your mouth. Nearly 18% of people report covering their teeth in photos because they don’t like the way they look. A big reason for that could be that they are missing teeth or they need some kind of prosthetic. Your choice between dental implants or dental bridges to help fill the gaps in your mouth will depend on how much you want to spend and how you want the replacements to look. If you have more questions, ask your family dentist.